You might not give your bite balance as much credit as it deserves! Then again, if things aren’t really quite balanced between your top and bottom teeth, well, you may be overlooking the fact that this is often the factor responsible for many of your smile woes. When you learn more about why it’s so important to attain and maintain balance, what may be causing your problems, and how to fix them, you will have a newfound appreciation for a beautifully aligned grin! To get started, our Austin, TX team is happy to offer introductory details. As you’re learning, in order to enjoy optimal oral health, you need bite balance. This means, of course, that your top and bottom teeth fit together. When they don’t, you may have trouble eating and speaking. Or, you may be able to accomplish these tasks but only as you end up tapping teeth together that are not meant to collide. Then again, you may shift your jaw into new positions in order to try to stop this from happening. When you end up with teeth coming into contact at points that should not touch or when you shift your jaw, you promote problems like damaged teeth, bruxism, and TMJ disorder! How Does Balance Become Damaged? How does your bite balance become damaged, you wonder? For some misalignment that forms naturally is the issue (fortunately, it’s treatable!). For others, the problem comes from damaged dental work, teeth that shift as a result of tooth loss, or damaged teeth! If you recognize that you are having problems with your bite balance, what you should not do is ignore it. What you should do? Our team invites you to contact us right away. We may repair or replace your dental prosthetic, help you with tooth replacement, offer ClearCorrect for misalignment, and more! We can even help you with issues that have developed due to bite balance problems, such as by addressing damage with restorative care. Not entirely sure what’s wrong but you are certain it’s time for care? Schedule your dental checkup soon. 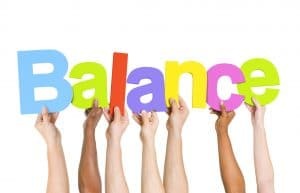 Come in for the care your smile may require in order to regain your smile balance and your oral health. Schedule a visit with your dentist in Austin, TX by contacting Austin General Dentistry today at 512-346-5540.